Editor's note: While many are celebrating the recent passage of CPM legislation in Maine, others have shared with MANA leadership their concerns about the specifics of the legislation and the particular legislative process. While MANA fully supports licensure in all 50 states, we also believe that, as more states engage in the process, we need to hear from all voices in the debate. 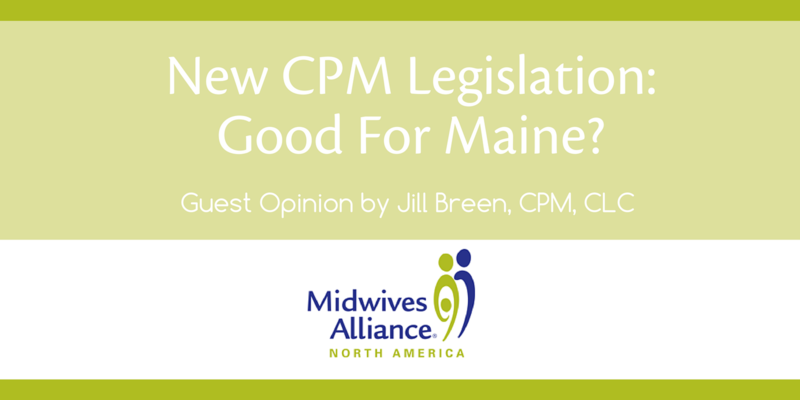 We asked Jill Breen, CPM, CLC of Maine to take off her official MANA communications chair hat and share with us her personal perspective on the changes in her state. What follows is Jill's personal response. Like all guest posts at MANA, this post represents her experiences in Maine and should not be construed as MANA's position. While some midwives in Maine are celebrating the fruits of their labors, others are grieving for their beautiful state. It is a sad time for Maine families who will not in the future be able to use the midwife of their choice. A bill to license certified midwives cleared its final hurdle on April 29, 2016 when the legislature, after intense lobbying from medical influences, voted to override the Governor's veto and pass it into enactment, in spite of hundreds of calls urging them to sustain the veto. As of Jan 1, 2020 only licensed midwives will be legal to practice, only MEAC accredited CPMs may be licensed, unless the current PEP CPMs have completed a "Bridge" to accreditation by that date. After that date no new PEP CPMs will be able to "bridge" to licensure, as per US MERA language. The statute itself states that no licensed midwives may attend breeches, twins or VBACs in an out-of-hospital setting. Although that restriction has an expiration date in a few years the decisions about scope of practice rules and regs, including lifting the ban on VBACs will be made by The Complementary Medicine Board composed of several naturopaths and accupuncturists, a consumer, and now 2 certified midwives and 2 physicians. The Board of Medicine also has joint rulemaking rights until 2021. With the appalling C-section rates, the lack of access to hospital VBAC, the lack of training for physicians in vaginal birth for breeches and twins, and the hospital liability insurance restrictions, the birthing population of Maine will be under the gun, or should I say knife, for the foreseeable future. For 230 years, since the time of Martha Moore Ballard and the settling of Maine, midwives have been free to practice and families have been free to choose how, where and with whom to birth their babies.This is the founding principle of both MANA and Midwives of Maine, the 2 organizations I have been devoted to and who, for over 33 years, have worked to ensure competency and accountability while protecting these rights to care and be cared for. Unfortunately this new Maine law does not meet that standard. Crafted in collaboration with the Maine Medical Association and other medical practitioners including CNMs, OB nurses, ACOG and several others, along with 6 CPMs, compromises were made in an effort to reach an understanding and gain support for the bill. The position of the Governor and the Commissioner of the Department of Professional Regulation have consistently asserted to the legislature and the public that there is no need to regulate midwives who already have a national credential, have a good track record and pose no threat to public safety. The Governor is absolutely correct when he says in his veto letter that licensure leads to "economic protectionism" - allowing some midwives to practice and not others, and "over-regulation" - allowing midwives to serve some people but not others. He said he was contacted by "many midwives" and dozens of Maine people urging him to veto this bill. The autonomous practice of midwifery includes risk assessment, informed consent and refusal, peer review, and ethical behavior. These are the tools of self-regulation and protection, in my opinion not needing legislation to achieve. There has never been an illegal midwife in Maine. Now, thanks to this law, there will be. It is a shame that this happened in a state where midwives are already legal, are recognized by the state in statute, and have good relations with state agencies. I believe some midwives will "go underground", some will retire, and many others will go through the mechanism and expense of licensure. More layers, more cost, more restrictions. I sincerely hope that Maine families benefit more from the advantages of licensure than suffer from the disadvantages. People should always be able to choose their midwife and their midwife be able to choose them. With a heavy heart, I raise my glass of cider to Maine, the way life used to be. Thank you, Jill, for this very important perspective on an extremely complex issue. The idea of licensure (or legality) in all 50 states has a rah rah sound to it, one that everyone seems to be able to get behind. Unfortunately, nothing is ever as simple as it seems, and when agencies, governments, and organizations get involved there is always compromise. Unfortunately again, this compromise more often than not seems to water down and restrict the care that midwives are able to provide consumers who have a right to that care. In the midst of all the celebrating there are those who are left behind and worse, left out completely. Let's hope the midwives and birthing women and trans folks in Maine aren't going to have to be fighting for those birthing rights in a few short years. While Vicki correctly points out that often there is compromise with legislative change, my concern is that the conclusions reached within the US MERA process have been interpreted differently by participating organizations. NACPM and ACNM rapidly rolled out and promoted legislation, on both state and national levels, based on the assumed "agreement" that all future CPM's will be required to have completed MEAC-accredited educational programs, and that the Bridge program for PEP-educated CPM's is temporary. My understanding, from personal conversations with representatives from MANA and NARM, is that the Bridge program was NOT introduced nor agreed upon as a temporary grandmothering process, but as a permanent one which retains PEP + Bridge as a parallel, legitimate educational pathway. (Recall that, as ACNM increased their own educational requirements, first from Associate RN + Certificate to Bachelors degree, then later to Masters degree, permanent grandmothering was included. I am sure I am not alone in being confused - what actually WAS agreed upon at the US MERA? Did we "give away" any non-MEAC educational options" Did we "give away" permanent Bridge program status (and in effect put a short-term limit on grandmothering)? Did we "give up" state control to define who is a midwife, in favor of having midwifery defined by national Medicare legislation crafted by ACNM and NACPM, but without MANA and NARM participation? If the above are so, then Maine is but the first casualty. If they are not, then we need to quickly and loudly add the voice of MANA to clarify what US MERA means.